I have always loved colouring in! It was something I would spend hours doing as a child and remains a firm favourite for me! Petal Passion Memories & More cards make great card fronts! I don't always have much time to spend on it now though so I'm loving the Petal Passion Memories & More Card Pack! They make it so easy to squeeze in a little bit of colouring for a great effect! For this particular card I used the Stampin' Blends alcohol markers. 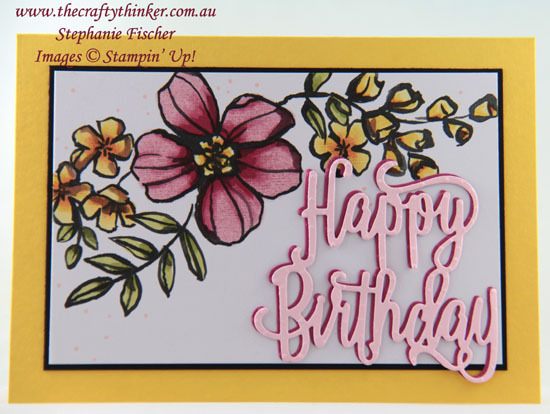 I used the Happy Birthday die on scraps of Rose Red and Pink Pirouette cardstock and layered them together for the shadow effect - easy to do with the Multipurpose Adhesive Sheet applied to the back of the cardstock before cutting! The base card is Daffodil Delight and I added a layer of Basic Black cardstock behind the decorated card.